Home > Our Blogs > Learn+Teach+Share > Happy Birthday, Anne! It's such a simple statement really, yet it gets right to the heart of a journal's purpose - to provide a safe space for our thoughts, feelings and uncertainties. Perhaps it's the "safe space" of a journal that has resonated with readers for generations. In her personal reflections, we recognize the triumphs and tribulations of adolescence, we feel the depth of Anne's compassion and humanity, and we sense a certain kinship with Anne as she explored her identity and became increasingly self-aware. Self-awareness is just one of the benefits of keeping a journal, whether a paper "diary" or an app on our phone, and one of the many reasons I use journaling in my classroom. If we want our students to develop the ability to critically examine their surroundings, we as educators must give them many opportunities to do so and multiple avenues to achieve this end. Both classroom discussions and art projects can provide occasions for students to delve into a topic more deeply, but there's just something about journaling that promotes, supports, and helps clarify our thinking. While it is true that some personalities are inherently more introspective than others, the ability to reflect is a behavior that can be developed in people over time and has tremendous benefits. Journaling requires students to move beyond the passive assimilation of knowledge and the regurgitation of facts - it moves students into the realm of inquiry and helps them relate topics of study to their own lives. Too often, emotional responses and feelings are downplayed in the classroom setting because educators are uncertain how to navigate the terrain or fear that an "exploration of feelings" will take precious time away from stated curricular goals. But the truth of it is, when students tap into their emotional responses they forge personal connections with the material presented and are motivated to engage intellectually. In order for students to believe that they "own" knowledge, we must allow them to construct personal insights. If we want our students to consider moral and ethical dilemmas we must give them an inviolable space to contemplate and reflect. If we desire our students to elaborate, we must provide them with opportunities to compare what they are learning with what they already know and understand. The construction of knowledge can be a messy process, but we shouldn't be deterred. Classroom journals can serve as a safe platform where students can "roll up their sleeves" both to think about what they know and challenge themselves to find solutions or consider alternatives. Anne Frank's diary, of course, is more than a collection of one girl's thoughts and opinions. First published in 1947 and translated into more than fifty languages, the diary serves as a historical document and an important 1st person account of a Jewish girl living in Europe during World War II. To countless people around the world, Anne Frank is the "face" of the Holocaust. For many, it is Anne's deeply personal story that keeps the overwhelming crush of statistics from feeling distant and abstract. Her single authentic voice provides us a way to grasp the incomprehensible. 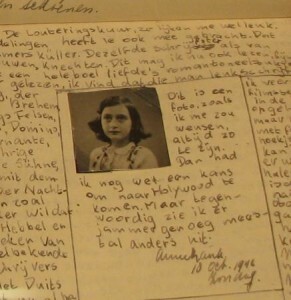 Most diaries will not have the reach or the impact of Anne Frank's, but journaling is an important endeavor with significant outcomes nonetheless. Anne believed that"Everyone has inside of him a piece of good news. The good news is that you don't know how great you can be! How much you can love! What you can accomplish! And what your potential is!" Allowing our students to journal and encouraging them to engage in critical reflection is one way we can help our students discover that "piece of good news" within. How do you use journals in your classroom? What is your experience with teaching about Anne Frank? Want to learn more? Click on any of the links below. EXPLORE the life and legacy of Anne Frank through the new exhibit now open at the Museum of Tolerance. FIND ADDITIONAL STRATEGIES for using journals in a Facing History classroom. TEACH this history more effectively by joining other educators at our seminar on the Holocaust and Human Behavior, beginning June 16th in Los Angeles. 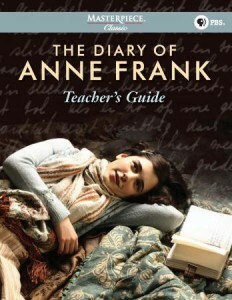 DOWNLOAD the PBS Teacher's Guide to "Diary of Anne Frank."